Tomorrow I’ll be taking the train to the hospital where I had the first stage of my two-stage urethroplasty. After quite a long wait I’m finally getting the second stage surgery. Also, someone called Rebecca contacted me through the form on this blog but my reply got bounced back because there was a mistake in the address. So if you’re reading this Rebecca, please try again, I’m not ignoring you. I had my x-ray appointment a couple of weeks ago. 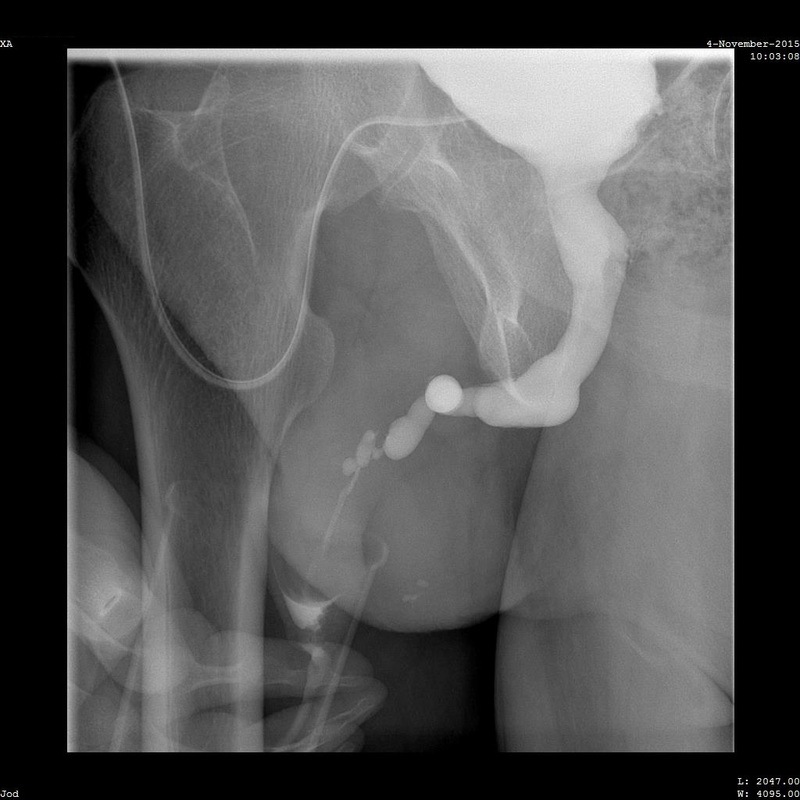 It seemed to go much more easily than previous urethrograms; having a suprapubic catheter makes it much easier to fill the bladder with contrast. Unfortunately it turns out that the urologist had only ordered a voiding cystourethrogram and not a retrograde one. That meant that there was too little flow after the stricture to fill the urethra. The radiologist initially concluded that there was a huge stricture all the way from the inner end of the graft right to the meatus. They looked at the pictures again, together with the urologists, and decided that instead it’s two very narrow strictures with about 5 mm between them. Of course, it’s impossible to tell how long the outer stricture is, or anything else about the urethra after that point. I’ve been communicating with one of the urologists by email and he seems oddly resistant to the idea of doing a retrograde cystourethrogram. The current delaying tactic is to ask a colleague in another county for advice. That of course means letters going back and forth in the post, so it’ll be at least another week before they hear back from him. So it seems I’ll be stuck with the suprapubic catheter for quite a while longer. There’s basically no chance of getting anything useful done before Christmas now. Here’s an animation from the cystourethrogram. You can clearly see how the urethra upstream of the stricture gets stretched by the pressure and how long it takes for the urine/contrast to get past the stricture. I made an appointment at the local hospital’s STD clinic, thinking they were a good way to get into the system. They found evidence of inflammation in my urethra (which has been happening for years, without any positive test results for infection) and immediately assumed it was being caused by an STD and wanted me to start on antibiotics while I waited for test results. Instead of waiting and taking antibiotics that I was fairly sure I didn’t need I made an appointment with my GP. He also immediately leapt to the conclusion that it was probably chlamydia. Fortunately my husband, who is himself a doctor, was there and pointed out that for men any sign of blood in the urine means that you should be referred to urology. The GP grudgingly gave in and referred me. The STD tests came back negative, unsurprisingly.